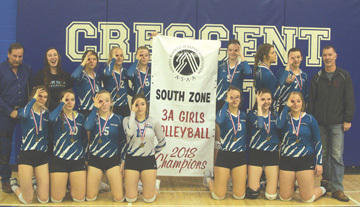 The Eagle Butte Talons senior girls volleyball team were the number one seed heading into Zones over the weekend at Crescent Heights High School and it showed as the ladies took home the gold medal and banner after sweeping the host Vikings in three sets in the final. “It was nice because there was a lot of pressure on us,” said Talons head coach Maurey Salmon. The final against the Vikings was the Talons’ best match, he said. “Once we knew we had provincial berth, we calmed down and just played some volleyball and relaxed,” he said. The path to victory was a grind and McCoy made Eagle Butte battle for every point in a thrilling four set semi-final. “McCoy is a good team and there was a lot of emotion in that game,” said Salmon. For Grade 12, Donera Resch, and the rest of her teammates, it was a nice breather to get to the finals and play team they are familiar with after going through the tough match against McCoy, who they only saw once all season. “We both wanted it equally, said Resch. Vikings coach Scott Galloway said his girls were not at their peak but played well enough to get to the final on home court. “Our entire goal this season has been trying to find one of those berths to provincials,” he said. It was a fun match for the Vikings to be in. “It was such a fun game,” said Vikes’ setter Litany Bloomfield. It has been over 20 years since a Crescent Heights girls volleyball team has made it to provincials and getting to the final on home court was a big accomplishment for the school. Both teams are playing in provincials this week in Beaver Lodge.